Model # FLW – Unlike our competitors plastic and multi-piece extruded aluminum lightweight SRLs and fall limiters, our cast aluminum FLW-11 can handle the rigors of everyday use. Because of its nearly indestructible housing and its very light weight, the Gemtor FLW is perfect for virtually all applications. Whether you’re on a construction site, using a warehouse order picker, in a manufacturing facility or performing maintenance, you will appreciate all the FLW has to offer. The External energy absorber provides an added level of security in the event that the device is subjected to unusually high forces. 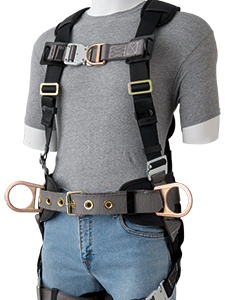 The FLW-11 incorporates a centrifugal braking system and external energy absorber that work together to ensure that fall arrest forces do not exceed 900 lbs.